Im also a bit of a tinkererer and plan to add plenty of mods to this puppy. It might be a little on the heavy side but im ok with that if it works out like I want. 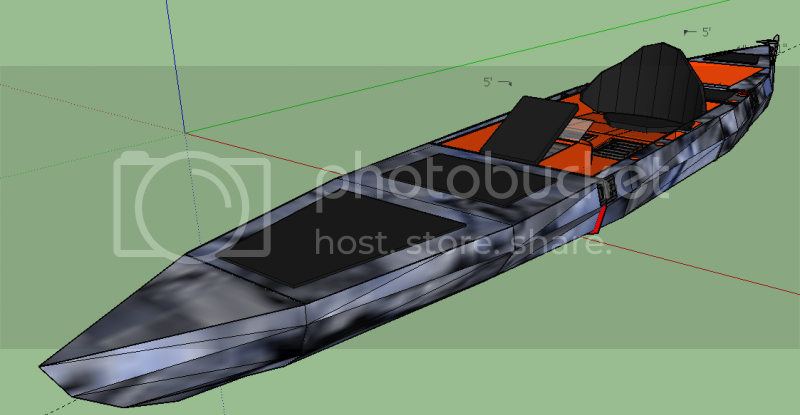 Ive drawn this Kayak 20 times in the 3-d modeling software Sketchup. Ill post pics of what I plan to do. Cockpit close up. Showing detail of the built in PLANO Guide series tackle boxes. I love the idea of built in boxes under my legs. Lift a leg grab a box... get what you need... Not sure about the size of the middle console but Im planning to use it to stow more PLANO boxes!! Rear hatch, tank well and DIY rudder system. The black areas are all removable hatch covers. Some will only be removable for maint or access to the guts. I like your ideas. Do you need any safety orange on the bottom? Some thoughts of mine and they are from the what's it worth department which means they probably are not worth anything. 1..The safety Orange on the inside is a good idea in one way , it is visible from a long distance for locating the boat if it is right side up. 2.. It will probably be hard on the paddlers eyes when paddling in direct sunlight , a bright direct glare. A..Safety orange is a lot better if it is seen from the sides so motor boaters do not run over you. A safety Orange flotation device , Sterns makes several different ones from the old fashion May West to a normal zip up vest type. B..I found that most of the time with a capsized craft the person is ejected from the craft , locating the craft is not the same as locating the person. Safety Orange on the person would aid the rescuers in locating the person or the body which ever the situation would be. 90% of the ones I located were normally three days after the capsizing when they came up to the surface or if before then with a bar dragging a lot of grappling ( way over sized treble hooks ) hooks off it to snag the body , usually non productive since a body can be a mile or more from the accident area , depending on the water currents. They were NOT wearing a flotation device.